John Brunner is always good for an interesting read. As a writer, he stewed up plots that, to my mind, are rarely matched in originality by other more celebrated writers. 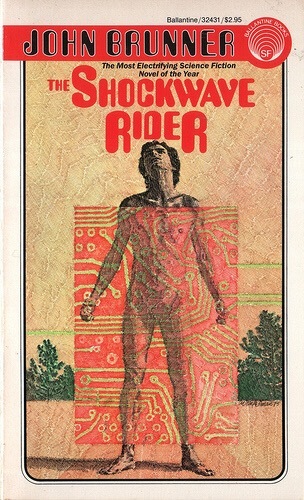 As much as I admire Brunner and his work, reading The Shockwave Rider was a real struggle despite the fact that I suspect the novel was fairly influential on what would become cyberpunk. 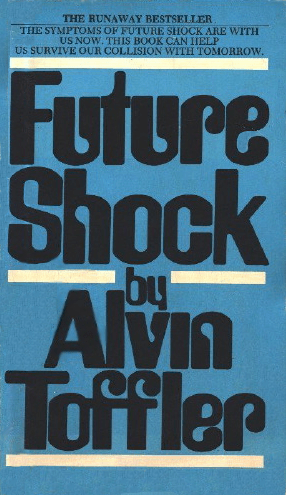 The core concepts behind the book lie in Alvin Toffler’s Future Shock. The basic premise is that the culture of early 21st century America moves at hyper speed, too quickly for most normal peopleto cope with. The protagonist, Nick Haflinger is no ordinary person though. He’s a computer genius who can also create new personalities, not just new identities, but new personalities, to keep himself one step ahead of a secret government/military school, called Tarnover, that he’s escaped from. Most vintage sci-fi, whether it is from the 40’s or 70’s, has artifacts like memory tapes or everyone smoking cigarettes, but it rarely makes the story difficult to get through. But the paranoia, fears, and sense of a radically changing world in Shockwave Rider are all very rooted in the 1970’s. So much so, that it is often difficult to get past the 70’s zeitgeist that is threaded throughout the story. Much of what Brunner wrote was fairly prescient, like computer worms on a global internet (the book is actually credited with being the originator of the term computer worm,) or light speed interpersonal communications, but culturally, we’ve moved past so much of what made the so called dangers identified in Future Shock that it’s too hard to understand or empathize with some of the various characters’ goals. If you’re a huge fan of Brunner, read it. If not, he has a lot of other, better, books.